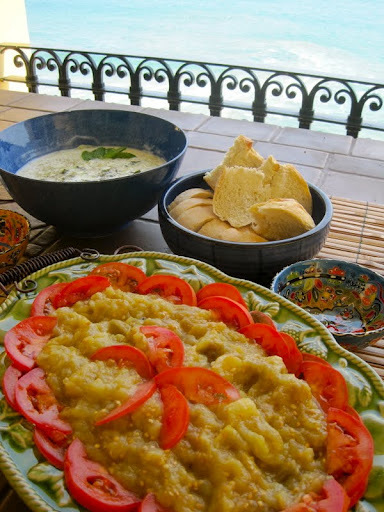 Turkish Cooking with a Mexican View | ¡VidaMaz! In my last post I told you all how I fell in love with Turkey: her beauty, history, people and blend of cultures. Well, I also loved the food. Succulent, savory lamb, and roasted and raw vegetables in multiple combinations with every meal. I especially loved how the Turks prepared eggplant, or patlican (pronounced “patlijan”). So, I bought Greg a book called “Turkish Cookery,” figuring his real gift would be that I’d try out some of the recipes. Today was my first try. I was of course worried. I’ve never cooked anything Turkish before. But man oh man oh man, was it good! At left is a glimpse of the meal we ate today on our Mexican terrace overlooking the Pacific Ocean. The weather here in Mazatlán has been very hot and humid. We took a long sweaty walk along the malecón/boardwalk this morning, and I then spent a couple of hours gardening. So, a cool meal sounded best today. 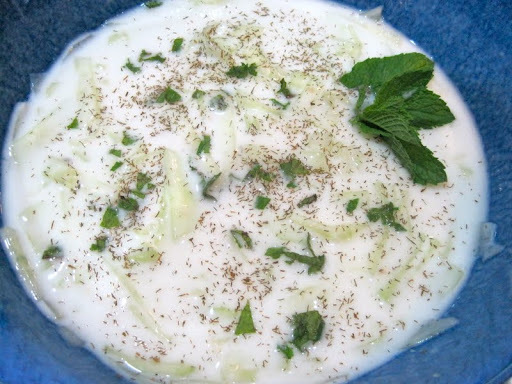 Cucumbers are in season here, so first on today’s Turkish menu was cacik (pronounced jajik), yoghurt with cucumbers. 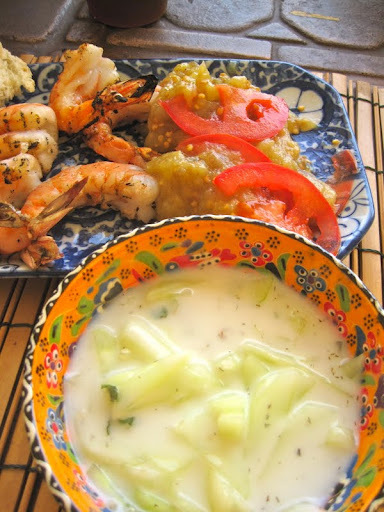 This dish is similar to Indian raita. I’d call it a cucumber-yoghurt salad, though my boys called it “cucumber soup.” I guess it is sort of like a gazpacho. 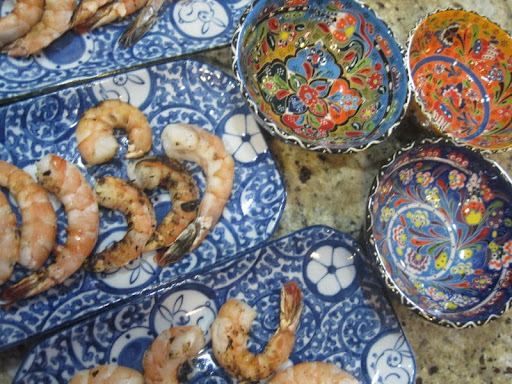 It was easy-peasy to make and I HIGHLY recommend it on a hot day! Peel, thinly slice and chop 2 large cukes. Sprinkle them with a bit (1 teaspoon or so) of sea salt. Let them sit. Put 500 grams plain yoghurt in a bowl, and with a whisk whip in about 1 cup of water. Add to the yoghurt mixture the salted cucumbers along with a clove of crushed garlic. Stir, and garnish with chopped fresh mint and dill. You can also drizzle a bit of olive oil on top (I didn’t and it still rocked). Be sure to chill this and eat it cold; the flavors really came forth after a couple of hours in the refrigerator. So refreshing! 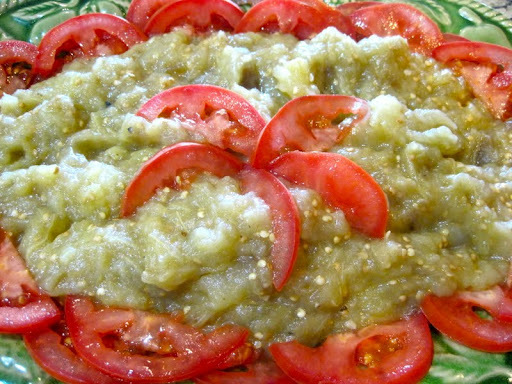 The second dish I made was the one I was really craving: patlican salatasi, or eggplant salad. 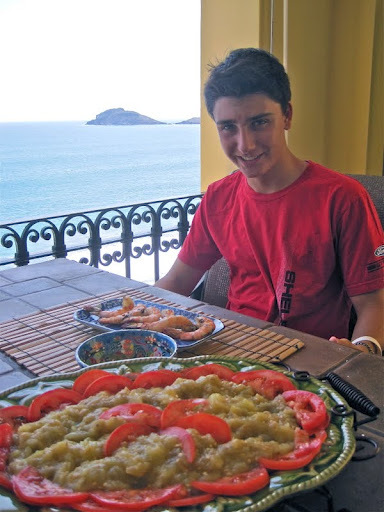 I ate this dish, or adaptations of this dish, quite a few times during my trip. Every time I’d ask the waiter, my meal mates or friends what the dish was called. Everytime they’d tell me “patlican,” “eggplant.” “Yes, I know it’s eggplant. But what is the name of the dish?” No one seemed to know. The photo in the cookbook looked like the dish I was craving, but what would it taste like???? First step was to mix the juice of one lemon with 1/2 cup of olive oil. 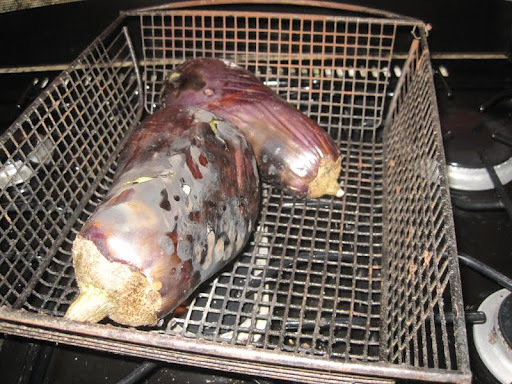 Then, just like in Japan, this recipe required that I roast the whole eggplants over an open flame, till the inside becomes tender and the outer skin becomes charred, then hold under cold running water for a few seconds before peeling off the skin. In Japanese cooking I absolutely love eggplant roasted in this fashion, and my taste proves consistent for Turkish cooking as well, evidently. After peeling the roasted eggplants (I roasted 3 big ones), you put them in a bowl and mash them up with a fork. I also used two knives like pastry knives to make sure all the pulp was cut and easy to eat. Into the mashed roasted eggplant I dumped the oil/lemon juice, added a tablespoon of balsamic vinegar, and a couple of cloves of minced garlic (the garlic wasn’t called for in the recipe, but hey, we love the stuff). I garnished the plate with sliced tomatoes (the recipe said to also garnish with onion, green pepper and olives), and we ate the roasted eggplant salad with French bread. Mmmmmm! Definitely a hit! 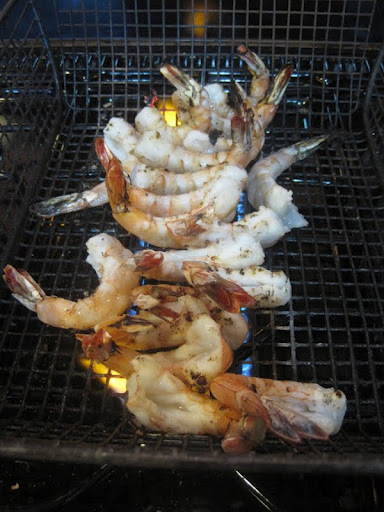 As long as I was roasting on top of the stove (too much work to start the grill, I guess, or maybe I just like that grill to be Greg’s territory), I figured I might as well roast the shrimp we had for lunch as well. After grilling I drizzled these with a bit of sesame oil and a bit of homemade aioli. What to serve all this in? While in Turkey I bought a few Kütahya bowls, underglazed and handpainted. You can see them in the photo at left, the bowls to the right of my Japanese plates. The Kütahya remind me of our Mexican Talavera, don’t you think? In the same way as Talavera, Kütahya painting varies widely quality-wise (and price-wise! ).